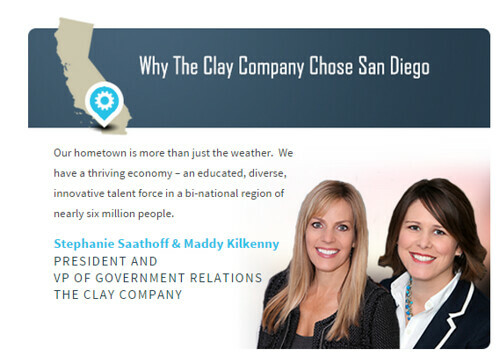 Meet the Clay Company – one of EDC’s newest investors. As the strategic extension of some of San Diego’s most dynamic companies and ventures, they have a pulse on the innovation that happens right in our backyard. Their clientele are indicative of San Diego as a whole: companies at the cross section of innovation and lifestyle. This week, we got the opportunity to speak with the Clay Co.’s Stephanie Saathoff, president, and Maddy Kilkenny, vice president, to learn more about how they view the region. 1) Tell us about the Clay Company. We are lobbyists, and we’re proud of that. 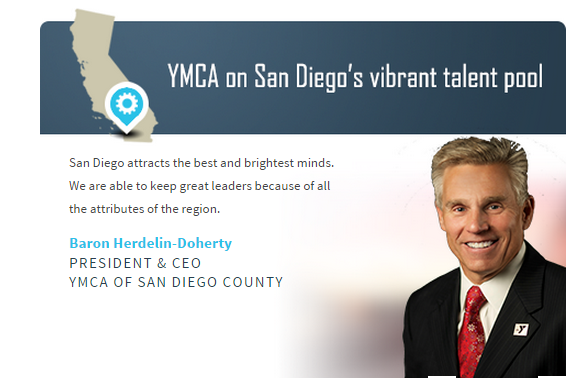 Our success truly is a combination of understanding what a realistic victory is for our clients, then working with elected officials, staff, the community and stakeholders, to bridge those interests and accomplish practical results that ultimately make San Diego County a better place to live, work, and invest. On any given day we might be touring the construction at the Cross Border Xpress in Otay Mesa, cruising around in a Car2go, or having lunch by the Koi pond at the Golden Door. Of course, we really do our best work over burritos in Old Town - unless it’s March Madness or the World Cup. No one works then. San Diego is home, and if that isn’t an advantage over everyone else in the country, then we don’t know what is. It’s where we both grew up and where we’re raising our kids. Our hometown is more than just the weather. We have a thriving economy – an educated, diverse, innovative talent force in a bi-national region of nearly six million people. We have thriving major universities that produce incredible talent both on and off the court. And, we are lucky to share a border with another country which exposes us every day to a rich cultural diversity that expands our region’s opportunities and horizons. San Diego has nationally recognized non-profits, award winning biotech companies, and acclaimed researchers that are creating Ebola vaccines and curing diseases. We are home to Donut Bar, Roberto’s Taco Shops, and Stone Brewery. “Advantage” is our middle name. 211 San Diego is a shining example of San Diego’s leadership in combining technology, innovation, customer service, non-profit sector and disaster response. Our local 211 is the national model, and peers around the country look to San Diego’s information and referral service to help them ramp up service, professionalism and financial stability. When our community is looking for reliable and timely information during a critical disaster, and every day, 24/7, a live voice and solid information make a huge difference. 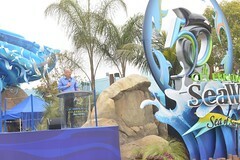 4) What do you anticipate for San Diego in five years? By 2019, San Diego will realize that we no longer need to justify being in the same conversation with great cities like Seattle, Boston, San Francisco, and New York, but that it’s actually the other way around. And we’ll stop saying that San Diego is the “biggest small town in America”. We will also be able to boast about being home to the person that found a cure for Alzheimer’s Disease. San Diego builds products and innovations that bring value to the rest of the world. However, San Diego’s story is a bit different from other regions across the country. Whereas many regions rely on a few large companies for the majority of their economic growth, San Diego’s story is one of building innovative, highly-valued companies from the ground up. Companies like RA Capital Advisors get that. 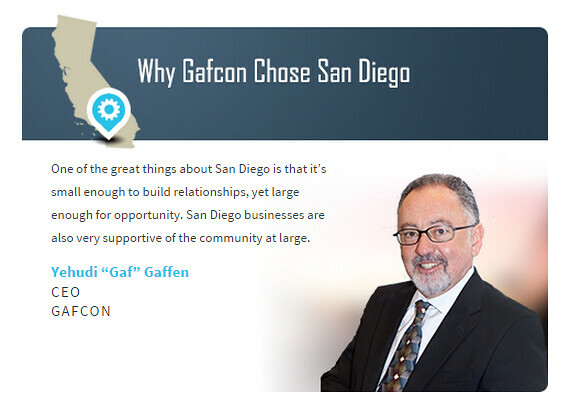 Having served the San Diego business community for more than 25 years, they have worked with clients across many of San Diego’s high-growth industries, including defense, energy, and manufacturing. This week, we sat down with RA Capital Advisors' Joel Reed to hear more about the competitive advantages of doing business in the region. RA Capital is a boutique investment bank providing financial advisory services to businesses both domestically and internationally. We focus on mergers, acquisitions dispositions and private financings, and have completed over $60 billion in transactions since founding our business in the San Diego area over 25 years ago. RA Capital has handled many large and high profile transactions, including helping our clients: use innovative technology to create substantial energy savings for commercial aircraft, combine their businesses into one of America's premier defense technology companies, finance construction of the largest fleet of ocean-going container ships, and realize many other entrepreneurial dreams. We bring that same experience to helping small and middle market business owners successfully build their companies, and realize their value when the time is right. 2. 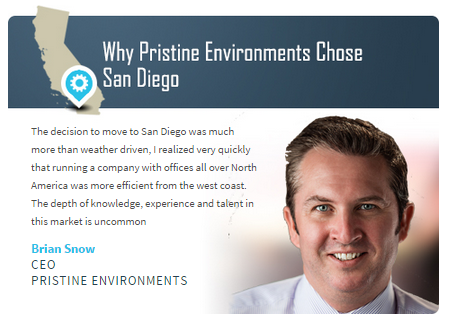 What are some advantages to doing business in SD? San Diego is a vibrant center for innovation, technology and entrepreneurship. Being in San Diego allows you to see great companies grow from the ground up. We have enjoyed working with companies as they grow new technologies or business ideas into successful companies like Sirius XM Radio, Sandel Avionics and The Titan Corporation. Many of our diverse clients have focused on specialized manufacturing, national security, aerospace, energy, and healthcare. San Diego offers these employers the opportunity to create challenging and rewarding jobs in a city with an outstanding quality of life, that is a preferred destination for many professionals and technologies. As companies such as Qualcomm, SAIC, and others have grown, they have generated many new businesses, reinvigorating the community. 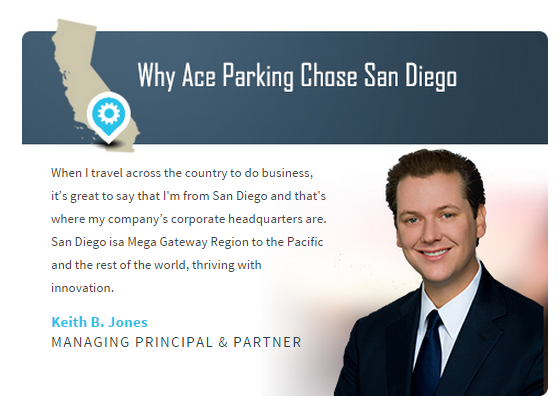 Facing the Pacific makes San Diego a great fit with our affiliate partners' offices in India and Malaysia, and local high tech companies often find our European affiliate offices to be a source of beneficial connections. 3. San Diego is full of dynamic companies, firms and service providers influencing global trends and innovation. Pick another San Diego company that is at the top of its game. Manufacturing and innovation are essential to the success of our community and our economy. D&K Engineering, located in Rancho Bernardo, is a very exciting example. D&K is a global product realization company specializing in the design, engineering and manufacturing of complex electromechanical products and equipment. Through innovation, collaboration and process discipline, D&K partners with organizations to create and build innovative products while reducing cost, accelerating time to market and ensuring product quality. As D&K puts it: they bridge the gap between concept and reality. 4. 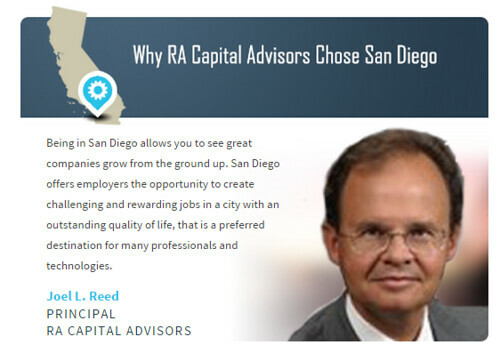 What do we anticipate for San Diego and RA Capital in five years? San Diego and its regional partners will emerge as a premier global city, exporting and exchanging products, technology and talent with its Asian neighbors and the rest of the world. Continuing innovations in technologies will require building upon our world class institutions of higher learning and expanding our highly skilled workforce. San Diego will build intelligent infrastructure to support this growth, while maintaining the unique beauty of our surrounding area and offering a lifestyle that attracts the active, intellectually curious individuals who create innovation. RA Capital will grow locally, while continuing to expand its global capabilities and be part of supporting this regional growth. We will help San Diego companies find the capital they need to grow, acquire the companies that complement their businesses and extend their reach around the globe. 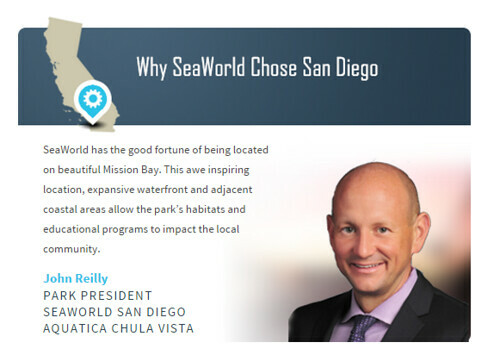 And, as we have always done, we will use our global experience and personal commitment as trusted advisors, to create value for clients, their owners, their employees and the San Diego community. RA Capital Advisors LLC is a Member of FINRA and SIPC. Uber, the ubiquitous transportation platform, has revolutionized the way San Diegans get around. But it’s more than just a logistics platform. Although Uber is available in more than 100 cities around the world, they have found a way to leverage San Diego’s unique assets, tapping into both the concentration of military personnel and cross-border economy. They are a high-tech company that has mastered the cross-over between innovation and quality of life – something San Diego knows well. 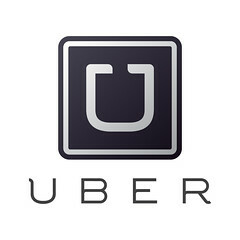 Uber is a technology company that is changing the way the world moves, works and lives. By seamlessly connecting riders to the safest, most reliable ride on the road, we’re making all of San Diego more accessible to locals and visitors alike at prices anyone can afford. And our growth in the city has been tremendous. When we launched in San Diego in early 2012, we partnered with a handful of drivers covering the Gaslamp. Today, we have thousands of drivers partnering with the Uber platform, with average pickup times of less than five minutes across San Diego. 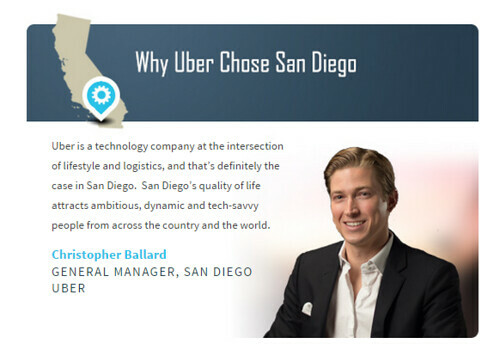 We like to say Uber is a technology company at the intersection of lifestyle and logistics, and that’s definitely the case in San Diego. San Diego’s quality of life attracts ambitious, dynamic and tech-savvy people from across the country and the world who regularly ride and drive with the Uber platform. We’ve also tapped into the tremendous talent, commitment and dedication of our city’s vast military community as part of our national UberMILITARY initiative, which started in San Diego. We are committing to onboarding 50,000 service members, veterans and military spouses over the next 18 months as driver-partners with the Uber platform. Also, San Diego has the unique distinction of being a border region. Having recently launched Uber Tijuana, we see a major opportunity in providing riders more choice in transportation options throughout the Cali-Baja Region. HouseCall is revolutionizing the home services space. Founded by ex-Qualcomm employees, the app allows people to book home services jobs directly with the service provider. As someone who doesn’t have a lot of time left in the day for household chores like cleaning the house or fixing a sink, having the option to press a button and receive immediate service from a vetted professional is a major way to stay productive. I see Uber weaving itself further into the fabric of city life in San Diego and cities across the globe. Right now, we’re connecting riders to drivers in less than five minutes. Once you get that right, the possibilities for on-demand delivery are endless, and the need to own a vehicle is diminished. Ultimately, we’re trying to make it so that car ownership isn’t necessary in San Diego. It’s an ambitious goal, but one we think is achievable. If we can make it so that it’s cheaper to take an Uber than own a car, we can boost productivity, reduce congestion, and help make San Diego an even better place to live. We also hope to facilitate stronger economic and social ties between Tijuana and San Diego by making seamless cross-border transportation a reality. Water is an essential part of the region’s economic health. From genomics to advanced manufacturing and beer, many of San Diego’s strongest industries are also those that use the most water. Amid one of the most severe droughts in the State’s history, local governments and water agencies have put in place restrictions to conserve and increase regional water flow to preserve the health of our economy and people. The San Diego County Water Authority (SDCWA) launched a When in Drought campaign to educate county residents and businesses about the need to conserve our water supply. The good news is that when it comes to these diversification efforts, San Diego is leading the pack. Thanks to the efforts of the SDCWA, the region no longer relies on one source for 95 percent of its water supply, instead looking to new sources such as recycled water as well as water storage to bolster these efforts. The recently-completed San Vicente Dam raise doubles the reservoir’s capacity. Another answer may be right in our backyard: when complete in 2015, the Carlsbad Desalination plant will be the largest of its kind in the Western hemisphere, and provide another local source of water. 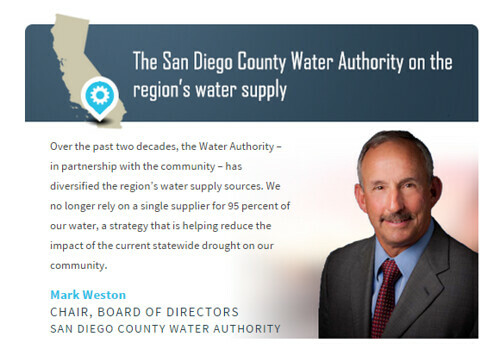 This week, we got to learn a little more about the region’s water supply – and what it means for our economic competitiveness - from Mark Weston, the newly-elected chair of the board of directors at the San Diego County Water Authority. Mr. Weston serves as the Poway representative. 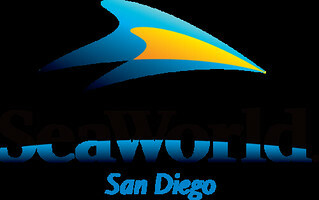 1) Tell us about the SDCWA. San Diego County is a wonderful place to live, but there are not local enough water supplies to support the region’s 3.1 million people and $206 billion economy*. That’s where the Water Authority comes in. We import water from distant sources and distribute it in five very large diameter pipelines to 24 retail water districts and cities. We also are helping to develop local water resources such as seawater desalination, and we are assisting our member agencies advance potable reuse, water recycling and groundwater. And, we promote water conservation to make the most of every drop. 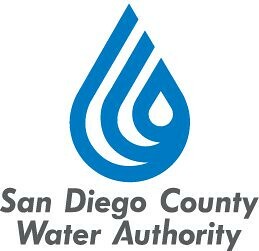 Established in 1944, the Water Authority service area stretches from Camp Pendleton to the Otay Water District on the U.S-Mexico border. Over the past two decades, the Water Authority – in partnership with the community – has diversified the region’s water supply sources. We no longer rely on a single supplier for 95 percent of our water, a strategy that is helping reduce the impact of the current statewide drought on our community. 2) What makes San Diego’s water supply unique? Our region is effectively at the end of two major pipelines that bring water from the Colorado River and Northern California. After the county’s imported water supplies were cut by 31 percent in 1991, the Water Authority and the region – with support from our member agencies and the business community – developed an aggressive plan to diversify our supply sources. The strategy included the nation’s largest agriculture-to-urban water transfer as part of the historic 2003 Colorado River Quantification Settlement Agreement. In addition, the Water Authority has promoted water conservation as a way of life, helping to reduce the region’s per capita water use by more than 20 percent since 2007. The Water Authority also has been a strong supporter of water recycling. And, in fall 2015, we expect to start buying water from the landmark Carlsbad Desalination Project. 3) Water is an essential component of our future. Pick a San Diego company that is paving the way when it comes to water conservation. San Diego Zoo Global recycles more than 16 million gallons of water annually and uses that water to support its horticultural collections. In addition, the Zoo uses water-saving technologies such as low-flow toilets, water reclamation ponds and evaporation-reducing mulch around plants. San Diego Zoo Global is also doing a great job spreading the word about the need for water conservation through: new signs at the San Diego Zoo and the San Diego Zoo Safari Park that emphasize WaterSmart practices; water conservation reminders during bus and tram tours; and social media posts that highlight California’s water supply challenges while encouraging its legions of supporters to conserve water. 4) What do you anticipate for the Water Authority in the next 5 years? What do you anticipate for San Diego? By 2020, the Water Authority anticipates achieving its long-term goals for creating a fully diversified water supply, and we also expect the region will meet the state Legislature’s mandate to reduce water use by 20 percent by 2020. But that doesn’t mean our job is done. The serious statewide drought and a changing climate will continue to challenge local and state water suppliers. For instance, if this winter is dry, it may mean reductions in the amount of imported water delivered to San Diego County by the Metropolitan Water District (MWD) of Southern California. While MWD is still our region’s largest water supplier, our diversification efforts will reduce the impacts on our community of any water allocations by MWD. About this time next year, the Carlsbad Desalination Project will generate 50 million gallons of water a day, enough to meet about 7 percent of regional demand in 2020. In addition, we will continue supporting our member agencies’ efforts to enhance groundwater supplies and water recycling. Several member agencies are developing or studying potable water reuse projects, and we have identified potable reuse as the region’s most likely next source of local supply. Finally, we will continue partnering with residents and businesses to conserve water, particularly outdoors.